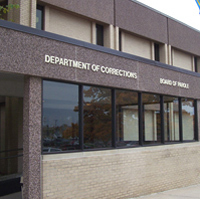 Corrections Department office in Des Moines. A western Iowa woman who was convicted last year in a disturbing kidnapping and torture case has died in prison. Rebecca Beyer of Council Bluffs was sentenced to life in prison last July after being convicted of abusing her developmentally impaired stepson. The 47-year-old Beyer died on Monday of natural causes from a form of skin cancer, according to the Iowa Department of Corrections. Beyer was arrested in 2013 after the 20-year-old victim told police he’d be kept locked inside a garage, attached to a wall with a dog leash and burned with forks, spoons and an iron that had been heated on a stove. The victim’s father and stepbrother, James Beyer and Ryan Smith, were also arrested in the case. Smith accepted a plea deal and was sentenced to two years probation. The Pottawattamie County Attorney’s office reports the case against James Beyer is still pending.